The annual Scarecrow Competition and Display features more than 100 colorful scarecrow creations showcased in an outdoor public exhibit from Monday, September 10th through Sunday, October 28th. Participants compete for $5,000 in prizes. 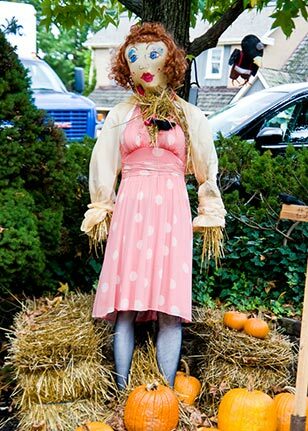 Peddler’s Village kicks off two months of fall family fun on Monday, September 10th with the annual Scarecrow Competition and Display followed by the annual Scarecrow Festival on Saturday, September 15th and Sunday, September 16th. Rain or shine. Admission and parking are free for all events. The annual Scarecrow Competition and Display features more than 100 colorful scarecrow creations showcased in an outdoor public exhibit from Monday, September 10th through Sunday, October 28th. Participants compete for $5,000 in prizes. The public votes for the winners during the first three weeks of the competition. The deadline to enter the contest is September 5th. The rules and registration information is available on the website by clicking here. The Keystone Krow 50th Anniversary Edition: A person, place or thing—past, present or future that says “Peddler’s Village” to you. Quite the Character Scarecrow: Open the world of possibilities as you create a scarecrow interpretation of your favorite television character—human, animal or animated! Traditional/Whirligig Scarecrow: Paying homage to the scarecrows that have been “scaring crows’ from the farmers’ fields and gardens for centuries. Parts move or make noise when the wind gusts to make it a true whirligig! An Extraordinary Contemporary Scarecrow: Not necessarily a “Scarecrow,” more like a cutting edge creation for the garden. Kids Only! Scarecrow, Sponsored by Giggleberry Fair: Kids 12 and under create crows and compete with their peers. Group Scarecrow: A group scarecrow project for a school, church, office, club, scout troop, neighborhood, etc. The Annual Scarecrow Festival on Saturday, September 15th and Sunday, September 16th, is a weekend of family fun including scarecrow-making workshops, pumpkin pie eating contests, pumpkin painting, live musical entertainment and children’s activities. 10 a.m. – 6 p.m. both days. Rain or shine. The Scarecrow-Making Workshops will take place both days on the Street Road Green at 10 a.m., 12 p.m., 2 p.m., and 4 p.m. Peddler’s Village staff will teach you how to create a unique, life-size scarecrow to take home and display. All scarecrow building materials are included in the $25 fee, maximum four people per scarecrow. Space is limited–reserve yours in advance! Registration information is available on the website or at 215-794-4000. Pumpkin Pie Eating Contests will be held both days at 3 p.m. on the Main Green. Categories are 10 years old and under, 11 to 14 years old and 15 years old and over. Sign up at the hospitality booth each day from 10 a.m. to 2:45 p.m. Six participants per age group, names are drawn before the contest at 3 p.m.
Pumpkin Painting will take place on the Main Green on Sunday from 11 a.m. until supplies run out. Brushes, paint and pumpkins will be provided and a nominal fee will be charged based on pumpkin weight. No reservations are needed for this first-come, first-served activity. In 2012, Peddler’s Village celebrates its 50th anniversary as the premier shopping and dining destination in Bucks County, PA. Follow the winding brick pathways of the colonial style village throughout 42 acres of award-winning gardens for a unique shopping and dining experience. Peddler’s Village has something for everyone, from 70 quality specialty shops and six restaurants to the 70-room Golden Plough Inn and Giggleberry Fair family entertainment center. Enjoy free seasonal festivals and year-round family events. For more information, please visit peddlersvillage.com or call 215-794-4000.